The structure of the earth is quite complex, with a molten core, a semi-liquid mantle, and a solid but moveable crust. So far, petrophysicists are only interested in the crust, where oil and gas and minerals can be found. But geophysicists are often interested in the deeper regions because they influence the speed and direction of seismic waves caused by earthquakes. Basic definitions are shown on the illustration below. Historical geological events determine the present arrangement of the rock layers in the crust. These events range from the slow and gradual, such as erosion and plate tectonics, to the catastrophic, such as meteor impacts or volcano eruptions. These processes continually modify the geometry of the rocks which make up the earth's crust, both on the continents and under the oceans. The surface crust is quite rigid, but is broken into a number of plates which are free to move over the mantle. About 75% of the Earth's surface is covered by oceans, each of which is underlain by one or more plates. The continents are land masses, predominately above sea level, which are also comprised of one or more plates. The motions of the plates relative to each other is called plate tectonics. The crust is also called the lithosphere and the upper part of the mantle is called the asthenosphere. Plate tectonics and migration of continents is a central feature in the present theory of the earth's structure. The concept was first mentioned by Antonio Snyder-Pelligreni in 1858, who attributed it to the Biblical flood. In 1912, Alfred Wegener, proposed a theory which accounted for the movement of the continents and the apparent wandering of the north and south poles. However, it was not until the mid-1960's, that Wegener's theory was widely accepted by the geological community, Tuzo Wilson of the University of Toronto being one of the significant contributors. The theory was originally described by the term continental drift, but it is evident that many other pieces of the surface move, and do not carry continents, so the term plate tectonics is preferred as it more correctly describes the real situation. 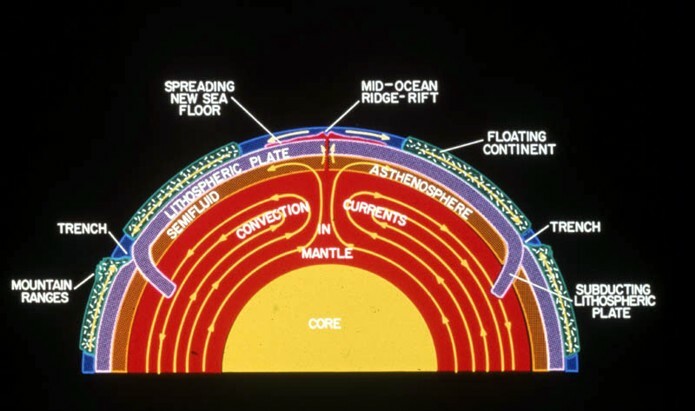 Exploration of the ocean floor, undertaken in the 1960's by the Deep Sea Drilling Project, indicates a ridge system circling the globe roughly in the middle of each ocean. The rocks in these mid-oceanic ridges are very young compared to the rest of the sea floor. Magnetic polarity reversals are used to estimate the ages of the rocks. This material is constantly being created as the sea floors spread outward from their centers. Because of this, and the fact that the earth is not growing larger in circumference, Wegener's theory was extended to include the movement of sea floor rocks underneath the continents in a process called subduction. Convergent plate boundaries cause compression of the earth's crust, resulting in folding, overthrusting, trenching, or crustal thickening. Divergent boundaries, on the other hand, cause rifting, down dropping, or thinning. The collision of a sea floor plate with a continental plate generally produces mountains, such as the Rocky Mountains along the west coast of North America, the Andes along the west coast of South America, and the Appalachian Mountains along the east coast of North America. The collision of two continental plates also creates mountains, such as the Himalayas at the boundary of the Indian and Asian subcontinents. The driving force behind the motion of the plates appears to be convection currents in the molten core of the earth, which flows beneath the continental plates dragging them slowly in the same direction as the current. The earth is divided into approximately eight large, rigid, but shifting, major plates and many hundreds of minor plates. The major plates support at least one massive continental plateau, often referred to as a craton. Listen HERE to a radio debate that illustrates how little was understood about these processes in 1965. Major continental plates, mid-oceanic ridges, transform faults, and subduction zones today, active volcanoes shown in red. One edge of a plate is a subduction zone, usually marked by a trench where the plate dives deeply into the earth's mantle, underneath another plate. On the opposite side of the plate is a mid-ocean ridge or pull-apart zone. As the rift opens, the gap is quickly healed from below by the inflow of molten rock. The other two sides of the plates connecting the rifts to the trenches are shear zones, called transform faults. There are thus three types of plate boundary, namely the divergent boundary (the mid-ocean rift), the shear boundaries (where plates slip past each other), and the convergent boundary (where two plates collide, with one usually being subducted and consumed). Plate tectonics has been modifying the position and shape of continents and oceans for at least 4 billion years. The animation at the right shows the movements from Late Precambrian to the present, as deduced from geological mapping of outcrop and subsurface examination of the ancient rock sequence. Hydrothermal processes have concentrated the majority of known metallic ore bodies along convergent plate boundaries, for example the gold fields of California and Alaska. These processes are occurring now at present continental margins and have occurred at ancient continental margins, some of which may be buried deeply under newer sediments. Hydrothermal processes are also active at divergent plate boundaries, such as the mid-Atlantic ridge and the Red Sea. An example of such an ore deposit can be found in Cypress where an ancient mid-oceanic ridge is now above sea level. In addition, convergent plate boundaries create conditions that permit accumulation of petroleum offshore or on land near shore. Because rocks are buckled and bent by plate movements, traps for hydrocarbons are formed. The heat and pressure induced by subsiding plates helps to liberate petroleum from its source rocks, leaving it free to migrate into the traps. Since sea floors accumulate considerable biological material that is dragged under the continents, it is possible that hydrocarbon from biological sources is constantly being created. There are also plausible theories that predict the generation of hydrocarbons from both biological and non-biological sources below the crust. Divergent plate boundaries, on the other hand, create conditions that favour the development of oil and gas accumulations on the continental shelf and in the ancient deep sea basin under the continental rise, such as in the Gulf of Mexico. Subsidence, uplift, and mountain building are terms used by geologists to describe the motion of part of a plate with respect to another part. The terms are used to bring the "Big Picture" of plate tectonics down to the regional level, and in fact, were used to describe geological features long before plate tectonics was an accepted theory. The cause of movements is the stress created by the relative motion of the continental and sea floor plates. These are generally very slow processes so that extremely accurate observations would have to be made for us to see the results of such movements. For example, the Rocky Mountains are still rising at the rate of several inches per hundred years, due to the Pacific Plate sliding underneath the western edge of the North American Plate. A geosyncline is a long prism of rock laid down on a subsiding region of the earth's crust. Geosynclines are fundamental geologic units. The geosyncline is formed of sedimentary rock deposited under the sea parallel to the coastline, and continues to grow in thickness as long as subsidence continues. The classic geosyncline is divided into two parts, namely a miogeocline, and a eugeocline which lies to the seaward side. The miogeocline is made up of sediments which form the continental shelf. The eugeocline consists of sediments on the continental rise in deeper water some distance offshore. If subsidence continues in spurts, more than one eugeocline can form, with the associated miogeocline lying on top of the previous eugeocline. A current example is the sedimentary section of the continental rise that lies seaward off the continental slope off the eastern United States. Landward of the rise and capping the continental shelf is a wedge of sediments that becomes progressively thicker as it extends towards the shelf edge. This wedge is the miogeocline and is really a very young geosyncline, before it is fully formed. The sediments are soft and relatively un-compacted. 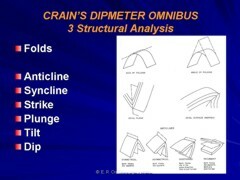 The source of sediments for the geosynclinal prism is from the continental craton. In the North American example, the majority of sediments from the continent are eventually dumped into the Atlantic Ocean and the Gulf of Mexico. Geosynclinal prisms are deposited along the trailing edge of a plate. If the continental plate changes its relative direction of motion, and the trailing edge becomes a leading edge, the geosyncline is compressed and folded. This has happened in eastern North America and caused the folding of the Appalachian Mountains. 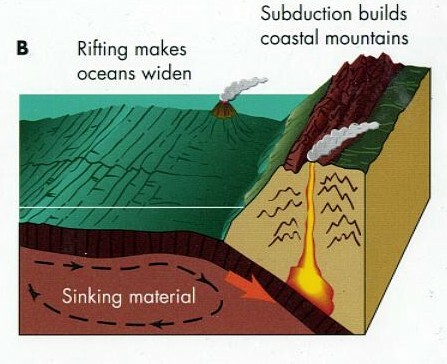 Sedimentation to form a geosyncline and subsequent folding constitutes a basic geologic cycle which evolves over several hundred million years, and may be repeated several times. Currently, the opening of the North Atlantic is progressing at the rate of 3 cm per year. The great sedimentary basin stretching from the Canadian Arctic through western Canada and the western United States to the Gulf of Mexico is another example of a geosyncline. The continental edge (miogeocline) was to the east and the seaward edge (eugeocline) was to the west. This geosyncline is being uplifted and folded by the pressure created by the collision of the North American plate with the Pacific Ocean plate.